We recently had a query from a user who asked us to explain the value of SCIS Subject Headings and the ScOT vocabulary — and the rather tricky subject of authority control. This query often comes up in our inbox, at conferences and at professional learning sessions, so now feels like a good time for a blog post on the matter. SCIS vs ScOT — which to choose? Firstly, we do not consider this an either/or scenario; nor do 100% of our users. SCIS Subject Headings have been developed and refined to support best-practice for resource management in education. SCIS records provide the foundation of consistent, best-quality metadata, to which ScOT headings can be a valuable supplement. The SCIS Subject Headings vocabulary dates back to the early 1980s and is a pre-coordinated subject headings list. It is intended as an educationally-focused alternative to the Library of Congress Subject Headings. SCIS subscribers can choose to supplement SCIS Subject Headings with ScOT, a post-coordinated vocabulary of topical headings. SCIS catalogue records contain SCIS’s authorized name and subject headings. However, on their own, records will not display the See and See Also references that provide the optimal search experience for your students and staff. SCIS Authority Files provide these references, as well as providing all authorized forms of names and subjects used as access points in SCIS catalogue records. Installing them will enable your library management system to automatically create cross references, which will be visible in your library catalogue. Schools can subscribe to SCIS Authority Files for only $90 per year, which includes both Name and Subject authorities. SCIS release a new version of the Authority Files twice a year, usually in March and August. SCIS Authority Files from SCIS on Vimeo. SCIS Name Authorities specify the authorized name of authors, illustrators, and other creators, be they corporate (eg “Primary English Teaching Association (Australia)”) or individual. This includes See references for non-authorized names. For example, if SCIS Name Authorities are installed and one of your staff search for “PETAA”, they will be directed to all works by “Primary English Teaching Association (Australia)”. Without Name Authorities, they may get no results. Not all systems support name authorities, so check with your vendor before installing them. If a user searches on the term “Hurricanes” without a See reference to direct them to the authorized SCIS subject heading, “Cyclones”, they may believe that the library does not contain any resources about hurricanes. See Also references exist between related terms and are important for assisting the user to find resources on similar subjects, such as directing users from “Cyclones” to the related topic “Tornadoes”. SCIS Subject Authority files include authorized names as subjects. That is, whilst SCIS Name Authorities specify the name “Carroll, Lewis” as an author of a work, SCIS Subject Authorities specify “Carroll, Lewis” as a subject for when a work is about Lewis Carroll. 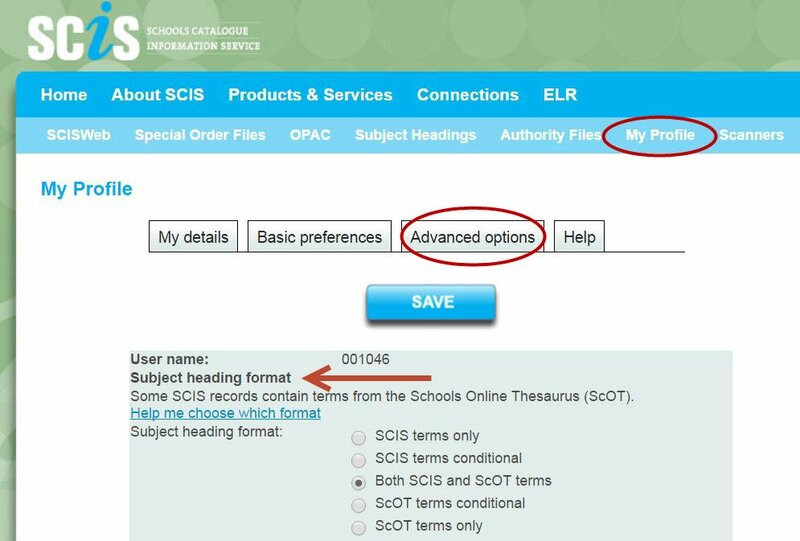 On the SCIS Authority Files page, schools need to choose which files they require: the SCIS Full Authority Files or the SCIS Reference Only Authority Files. The Full Authority files contain all authorised SCIS headings, including those without See and See Also references, such as “Science fiction films – History and criticism”. This may be useful for local cataloguing of resources not catalogued by SCIS, such as vertical file materials. Use the full list of authorised headings in your library system to ensure consistency with headings used in SCIS records. If most of your catalogue records are sourced from SCIS and you do little or no original cataloguing, you may decide you only need the significantly smaller SCIS Reference Only Authority Files. These contain only those headings that have See and/or See Also references. We recommend that all schools install at least the Reference Only Subject Authority Files. Twice a year, when SCIS release new versions of the Authority Files, go to the SCIS Authority Files page, select the correct files for you, and download them. The next step is to import them into your library management system. Read your system’s manual carefully for the settings to choose when importing the SCIS subject authority files. Imports should be regarded as an overnight housekeeping task as the download may take several hours. In current generation systems, many of the steps will be similar. In Oliver, go to Management > Import and select the MARC radio button. 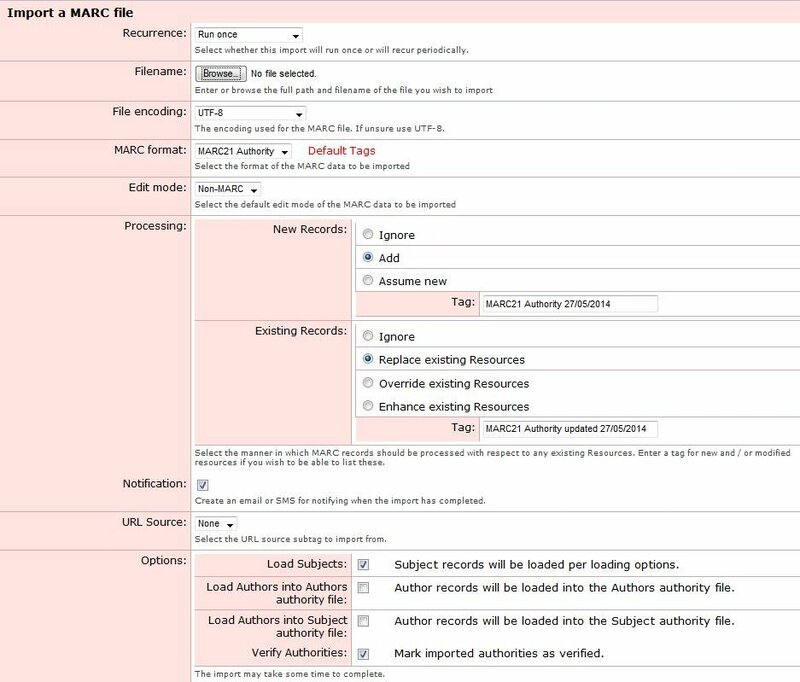 It is crucial to select “MARC-21 Authority” in the “MARC format” field is crucial. 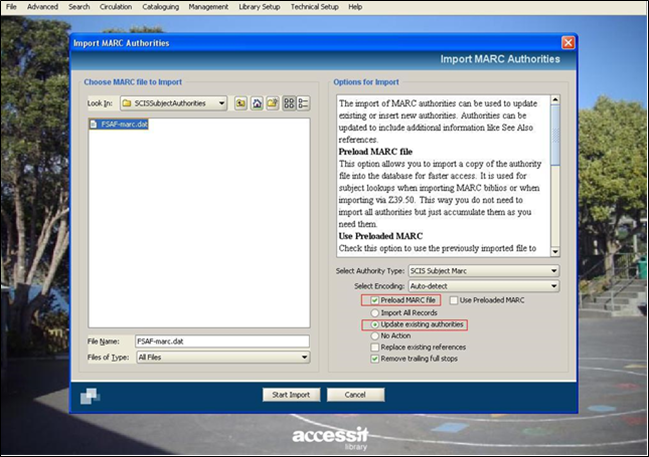 In Access-It, click Cataloguing > Imports > Import MARC Authorities. Choose how to deal with existing, duplicate authority records: Unless you want to retain any Subject Authorities you have created, it is important to replace the existing subject authorities with the new SCIS authorities. In Oliver, select “Replace existing resources”. Specify which authorities you are loading: In Oliver it is important to select “Load subjects” otherwise the subject authorities won’t be loaded. If you are importing Name Authorities, do not select “Load Authors into Subject Authority File” because SCIS Subject Authority files already contain author names as subjects. Specify file encoding: MARC authorities will be encoded in UTF-8. Select this in Oliver, and leave Access-It as “auto-detect”. Education Services Australia manages multiple vocabularies including SCIS Subject Headings List and ScOT. 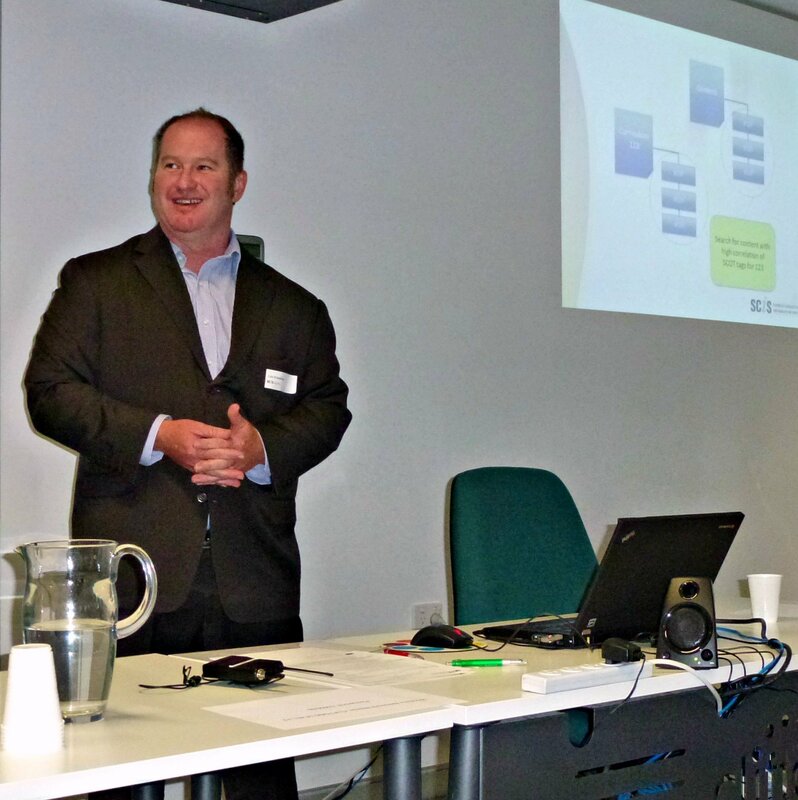 At the SCIS consultation SCIS Asks, Ben Chadwick, ESA Metadata analyst outlined how vocabularies assist search. Ben outlined how ScOT is published as open linked data and can be linked to other unique identifiers, inside and outside the vocabulary. It is available for consumption on the open web and is expressed in a standard, machine-readable format (RDF). viability of Linked Open Data authorities as a new model for authority files. Many have indicated that they would love to be able to search by curriculum in order to find related resources and that this would be a huge time saver. Suggestions included looking at the 658 MARC field to introduce a curriculum element. It was noted that there was demand for automated updating of bibliographic records. This would require a new process to ensure that library management systems can handle requests. It was agreed that the ability to refresh bibliographic and authority records is an important one and further discussion is needed about whether models of linked data could address this problem. Discussion followed as to future directions for SCIS in the area of subject access. The ScOT in SCIS project commenced in 2006 when the thinking was that keyword searching would become the pre-eminent means of resource retrieval. 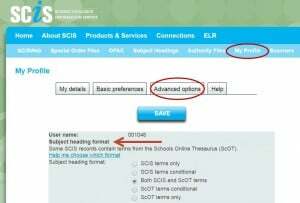 Since then SCIS has offered schools the option of downloading both SCIS Subject Headings and ScOT terms in their catalogue records. The challenge is how to manage and display both SCIS subject headings and ScOT terms in a meaningful way for users in order to exploit the inferred links between resources tagged with ScOT terms that match a curriculum tagged with ScOT terms. Also discussed was an alternative scenario of transition from use of SCIS Subject Headings to ScOT terms and how schools would manage this process. SCIS is conducting a consultation workshop in Melbourne on Tuesday 4 December 2012 from 9.00-1.00pm. The consultation aims to engage SCIS and its partners in discussion about future priorities in our support of school libraries. How will education libraries best serve their communities in 2015? How will SCIS and library system providers serve school libraries? Participants are encouraged to stay for a light lunch and then join delegates at the keynote session and opening reception for the IDEA 2012 conference at the Sofitel, 25 Collins Street Melbourne. resources on a particular subject. Selecting the subject tab before entering a search term provides the most comprehensive option for a subject heading search, looking for the subject term anywhere in subject, and returning any matching SCIS Subject Headings and ScOT terms in an alphabetical list. The number of related titles, and details of any broader and narrower terms are provided below the subject heading. While the default display is set to a list of 20 subject terms per page, this number can be changed to 10, 25 or 50 records per page prior to searching. The Subject browse drop down option within Basic search returns an alphabetical list of SCIS Subject Headings and ScOT terms that start with this term and also provides a count of titles and details of references. This is helpful for finding the most appropriate subdivision of a SCIS Subject Heading. Note: these search options will provide a list of records, not a list of subject headings. Subject search within basic search looks for the search term anywhere in any subject heading and returns the records that meet that criteria. Results are sorted alphabetically by title, but can be changed to a sort by publication date or author using the drop down options at the top right of the search results. To find the subject heading used for a particular title, click on the title to display the full record and view the subjects. Click through from the full record to investigate that subject heading further. 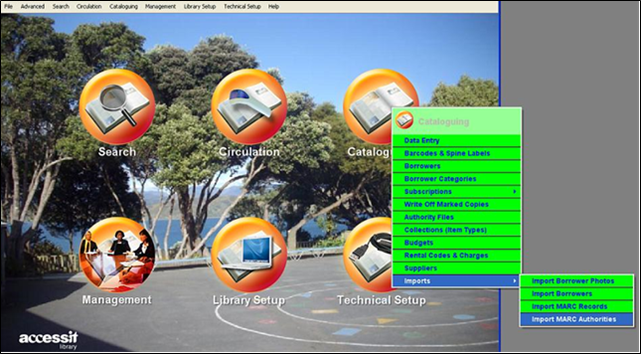 Advanced search is accessed from the top right hand banner menu of the SCIS Catalogue, and provides the option to combine a subject search with other search parameters. Advanced search will return a list of records, sorted alphabetically by title. Posted on November 25, 2011 February 28, 2012 Author PruCategories SearchTags SCIS Catalogue, Subject headings2 Comments on Which subject search? The SCIS Information Services Standards Committee met by teleconference on 25 May 2011. The major outcome of the teleconference is a revision of the SCIS subject heading hierarchy covering types of computers and device names. The New South Wales SCIS agency prepared the original paper which was raised for discussion in February 2011. As the paper was complex and included many aspects of the subject area of computers and related devices, further discussion and consultation, particularly with the WA SCIS agency was required before the proposal was approved. Most of these headings allow for the construction of further headings for specific devices, such as iPad (Tablet computer) and Kindle (E-book reader). Further details of the changes will be announced in the term 3 2011 issue of Connections (issue 78). Ever wondered how changes to the SCIS Standards for Cataloguing and Data Entry or SCIS Subject Headings are decided on? Both are the responsibility of the SCIS Information Services Standards Committee (ISSC), which is comprised of representatives from Education Services Australia, members of our agencies in the education departments of Queensland, Western Australia and New South Wales, and representatives from the National Library of New Zealand. Members of the ISSC also contribute to the Schools Online Thesaurus (ScOT) discussion group. The ISSC continually revises the SCIS Standards for Cataloguing and Data Entry and SCIS Subject Headings in order to ensure that they remain in keeping with international standards, whilst also ensuring that schools’ specialised needs are taken into account. Members of the ISSC draw on their experience in providing cataloguing and support services to school libraries and their links to curriculum experts within their organisations in order to provide informed discussion on the adoption of new or modified headings, alterations to the cataloguing standards and other enhancements to the SCIS service. The ISSC group conducts regular meetings throughout the year via teleconference, as well as utilising an edna group page which acts as an online forum for the exchange of discussion papers, regular updates and news. If you have any questions about how SCIS Standards for Cataloguing and Data Entry are implemented in SCIS bibliographic records, or wish to suggest a change to the SCIS Subject Headings we would love to hear from you. Drop us a line at scisinfo@esa.edu.au – we’re here to help!